People usually take India for granted in terms of tourism, but I must say that India is no less beautiful compared to any other place in the world. After seeing places like Sikkim, Chopta, Kashmir and many more I would like to share a small thought about a wrong impression among Indians. And in favor of that and contradicting to my own statement in my previous post where I used word mini- Switzerland to define Chopta, I would like to correct it by accepting the fact that no place in India should be called the mini Switzerland or compared with any other tourist destination as that downplays the individual identity of the place. I will make sure in my future posts that I don't repeat the same mistake also request you all to respect India tourism individualism. Sikkim is a landlocked state of India, located in the Himalayan mountains. The state is bordered by Nepal, Tibet and Bhutan. Kanchenjunga, the world's third highest peak is located on the Sikkim's border with Nepal. The capital city of Sikkim is Gangtok. Sikkim used to be an independent country until 1975 when it was annexed by India. It is said that and I also heard from a local person that Sikkim chose to become a part of India and appealed to the Indian Parliament for the same. After visiting Sikkim, I feel thankful to god for making this gem a part of India. Sikkim is the best place for those who love to trek, there are many options starting from 1 day onward. Another happening thing to do in Sikkim is Paragliding. There are 2 certified locations, Bulbulay Dara in Ranka and Baliman Dara, both are near Gangtok. One more thing which may attract you is a Gangtok ropeway in Deorali market close to MG Marg, Gangtok. Note- A point for solo female travelers that Sikkim is a very safe place to go though precautions and alertness are always required no matter wherever you travel to but you can consider this place to travel alone. FYI, the crime rate in Sikkim apparently is 0%. After knowing about this place through online surfing and a couple of people who had been to this heaven, it got added to my priority destinations list. Even though it took me quite a few years to execute the plan, but it was worth waiting. I did my research work, prepared my itinerary, booked my return tickets and like that the journey was on. 1) Nathula Pass, Indo- China border, altitude 14450 ft. It's located in East Sikkim at around 56 km from Gangtok. It stays closed on all Mondays and Tuesdays and open only till 1:30 PM for other days of the week. 2) Tsomgo Lake, a glacial lake, 40 km from Gangtok and 16 Km before Nathula pass. It's located at an elevation of 3753 Mt. 4) Gurudongmar Lake, located at the extreme corner of India and at an altitude of 17100 ft. is one of the highest lakes in the world. It lies in the north Sikkim and at around 45 km away from the nearest tourist accommodation, Lachen. 5) Chopta Valley on the way to Gurudongmar Lake is located at an altitude of around 13000 ft. It is famous for its alpine vegetation, rhododendrons and other high altitude vegetation. Note- It's an another Chopta valley in North Sikkim, don't confuse it with the one in Uttarakhand. 7) Yumesamdong (Zero point) around 24 km ahead of Yumthang valley is situated at an altitude of 15800 ft. Note for all- Protected Area Permit (PAP) is required to visit all the places mentioned above. Note for Foreign nationals- Nathula & Gurudongmar lake, being international border areas, are not allowed for foreign nationals. Though Tsomgo lake also called Changu lake and Baba temple on the way to Nathula pass & Chopta valley on the way to Gurudongmar lake allowed for the visit with a permit. In addition to that, all foreign nationals also require ILP (Inner Line Permit) which is apparently necessary to visit any part of the Sikkim and even to enter Sikkim. Unfortunately, I couldn't make it for the Kanchenjunga national park because it required at least 4 day trek and a little lack of my research made me miss this opportunity. So this is pending for my next trip to Sikkim as I am not going to let it go. I would also like to point out that there are other national parks and trekking routes which require permits too, but I specially mentioned this one because this is one of the main treks, my favorite and was supposed to be a part of my trip. But for now, let's enjoy one of my best trips. rains in most of the parts in India so was in Sikkim. Note- One can also opt to travel by flight. The nearest airport is Bagdogra near Siliguri, which is at a distance of 124 km from Gangtok. It was not raining in NJP the time I reached. My driver, who was appointed by Mr. D Lama, who arranged my stay and transport for the entire trip, was ready with the Innova cab and already waiting for me, he was only appointed for dropping me till Sikkim. I don't remember his name as it was an unusual name but he was a kind of a character. He was very communicative, smiling all the time and overwhelmed. I could totally relate with him as I shared all these three qualities of his. It was late and almost everything got shut on the way, but luckily we found a place open before reaching Siliguri and I tried veg momos, it was served with a specific sauce they made and which was very yummy and these are the moments when we say 'finger licking is good' tarararara. All the way, he was just praising Sikkim that showed his love with his state well, who wouldn't love Sikkim. 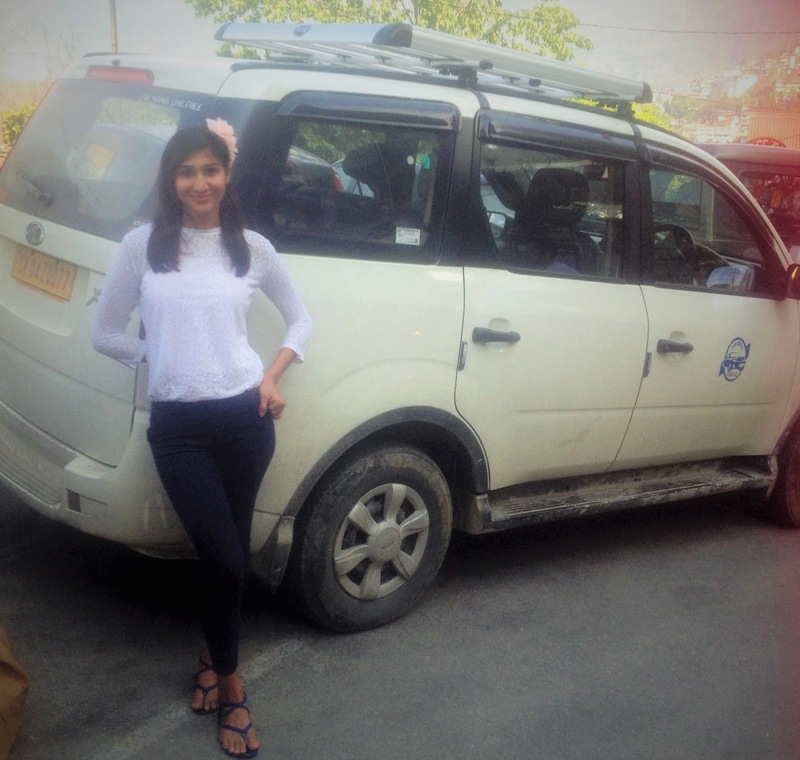 He also mentioned to me that I wouldn't need to ask him if we reached Sikkim as I would get to know by itself as soon as we would enter the Sikkim zone. From Sevoke road, Siliguri we took NH31A which connects Siliguri and Gangtok. The roads were smooth all the way till Sikkim, the views were amazing according to my driver and he also mentioned about a beautiful river Teesta flowing alongside but since it was dark I could only enjoy it through his words. We crossed Rangpo check post, and as soon as we reached Deorali it started raining. Note- Rangpo check post is a gateway of east Sikkim where one needs to take permit. And Gangtok is around 25 km further. West Bengal registered vehicles are only allowed till Deorali taxi stand near Gangtok and from Deorali one needs to take a local Sikkim transport to reach Gangtok. It was around 10:30 pm when we stopped outside my hotel in MG Marg, the main market area and the mall road of Gangtok. Everything was shut, it was dark & cold and it felt so peaceful in spite of the rains. Mr Lama was already waiting outside the hotel to welcome me, it was so sweet of him to manage to come that late and that too when it was raining cats and dogs. He appeared to be a gentleman, marvelous person and a very nice human being in the first interaction I had with him in person. After greeting, we had a short conversation about how the climate was all fine till a day before I reached, also that a visit to Nathula seemed to be dicey as the roads were closed due to the rains which instantly took my smile away but he suggested not to loose hope. He left after we decided morning's time for the local sightseeing. It continued to rain the next day and I had no option to waste my day, but I had improved in packing and got my umbrella this time. After getting ready and having breakfast I got down from the hotel at the decided time, 8 AM. Saju, my driver for the day and Mr. Lama were already waiting for me. After we all greeted each other, I and Saju, who was very shy and non talkative started for the day trip. It is situated next to White memorial house and just below Ridge Park. It's very close and at a walkable distance from MG Marg. Different species of Orchid, lilies, Anthurium,Chrysanthemum etc. can be found here. Best time to visit is April- May (spring season). It is located at around 8 Km away from Gangtok. It is called a viewpoint for a reason, because it offers spectacular views of the Kanchenjunga mountain range, Phodong & Labrang Monasteries and the distant villages of North Sikkim. One should enjoy sunrise from here, it's miraculous. There is a resting shed, a park and a cafeteria constructed by Tourism department. I could not enjoy the views exactly as it is mentioned because of the rain and cloudy weather, but I captured a different side of nature while enjoying a hot cup of coffee in the cafeteria. This is how it looked when I was there. I personally like hills and sceneries partly covered with clouds as it adds a unique beauty to it and gives a different feel of nature, but definitely the views on the clear days would be much more scenic. Situated at around 20 minutes drive from Gangtok and very close to the Tashi view point. Although the height of this waterfall is not much, but both the width and the greenery around add beauty to it. It is a famous God Ganesha temple in Gangtok located at an altitude of 6500 ft. and it is close to the Tashi view point. This temple also offers splendid views of the magnificent Kanchenjunga mountain. It started raining heavily by the time I reached Ganesh tok so it couldn't be possible to take pictures of the views from the temple. Instead, I took pictures after the rains slowed down from a small restaurant in the parking area where I had Wai-Wai noodles and tea. This zoo is not like any other zoo in India. The animals here are kept in their natural habitats. It is situated at the distance of 3 km from Gangtok at an altitude of about 6000 ft. It requires a lot of walking inside the park, which is also the right way to enjoy it. It somewhat gives a feel of a semi-national park where one can actually walk and encounter the animals. It's a temple of Lord Hanuman, located at an altitude of around 7100 ft and about 11 km away from Gangtok. The ambiance here is wonderful and the views it offers is one of the best in the whole Gangtok. This temple was handed over to the Indian army in 1968 and since then it has been maintained by 17 mountain divisions of the army. soup with vegetables and a local dish and which was by the way mouth watering. 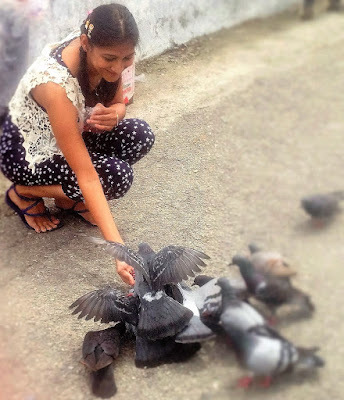 Later in the evening I strolled in Mg Marg and near by which was my routine for every evening till I was in Gangtok. By strolling I explored a small place in the corner where they made amazing chicken rolls not just chicken, but that's what I tried and it was so yum- yum. By night, Mr. Lama called and suggested to keep 14th for the rest of the local sightseeing which earlier was kept for Nathula pass, but since the roads were still closed, we had to postpone it for 15th which was also not a sure thing because it was all depending on the weather and the roads. Since 15th was my last option to visit Nathula because on 16th I had to leave for north Sikkim, it made me feel disheartened and I prayed hard for the clear sky and open roads. Luckily, today it stopped raining and the day got clear. A different driver called Neil came to pick me, who was very down to earth, a little interactive and respectful, in that regard, all the drivers accompanied me were very decent and respectful. It's a stupa located on a hillock and it was built in 1945 by Trulshik Rinpoche, head of the Nyingma order of Tibetan Buddhism. 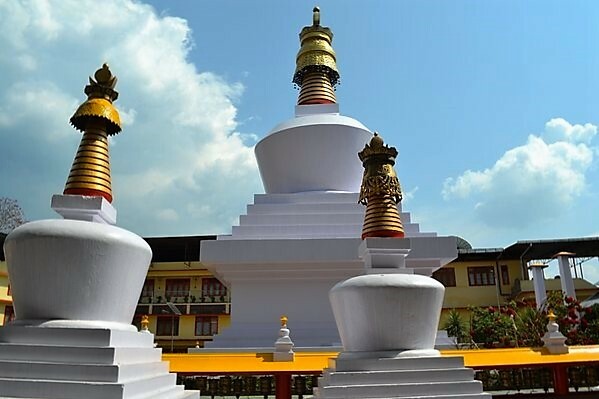 The stupa is girdled with 108 prayer wheels which have a holy inscription engraved on all, Om Mani Padma Hum. It is said that while spinning these prayer wheels clockwise, the person has to chant the mantras engraved on them. 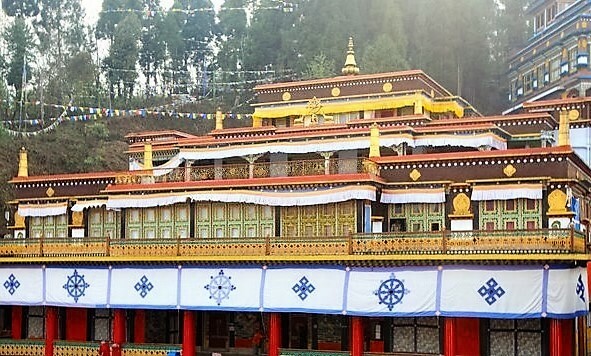 It was originally built in the mid 1700s, under the direction of Changchub Dorje, 12th Karmapa Lama and rebuilt in the 1960s by the 16th Karmapa as his main seat in exile. It's also called 'The Dharmachakra Center". At present it is the largest monastery in Gangtok. It is located around 25 km away from Gangtok at an altitude of about 4900 ft. Rumtek offers amazing views. Later, I had chicken momos for lunch in one of the few restaurants below Rumtek near the parking area. I don't disrespect food usually, but it was a disaster and the only bad food experience during the whole trip. 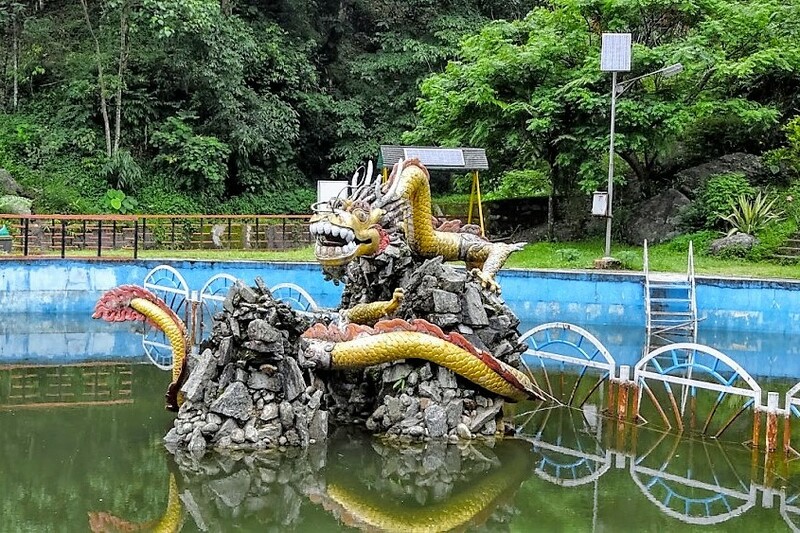 At around 10 km from Gangtok on the way to Ranka lies this almost 40 ft. beautiful waterfall in this theme park of ethnic sculptures and figurines depicting jhakri culture. As local people's believe Banjhakri resides in the forest and live in the rock caves worshiping spirits where 'ban' means forest and 'jhakri' means traditional healer. 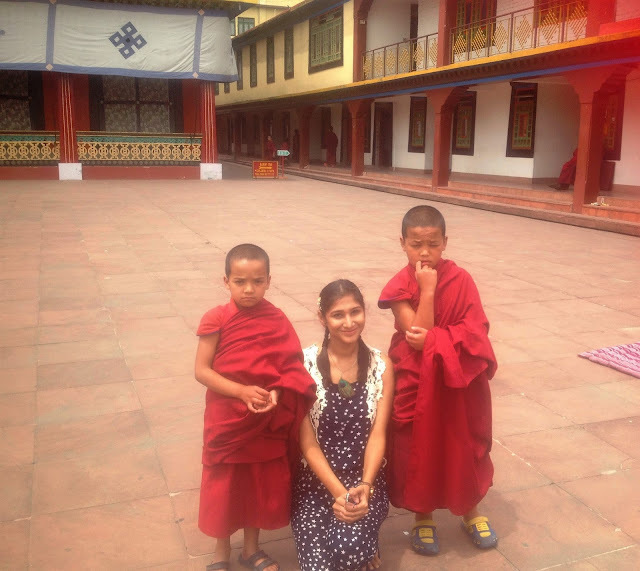 It is also known as Lingdum Monastery, located at around 20 km away from Gangtok. You will find a collection of colorful Tibetan paintings here called Thangkas. A huge gold plated Buddha statue sits in the lotus position inside the sanctum. Spinning the prayer wheels here is considered for good luck. As a cherry on a cake, the sunset view you get from here is splendid. It was the last of Gangtok local sights. By evening I got a good news. God had heard my prayer and granted it. The roads were open and next morning I had to leave for Nathula pass including Tsogmo lake and Baba temple. I was so excited and happy because I could not afford to miss it. For that matter of fact, there was nothing in this trip which I could think of missing. Though in spite of that I had to miss Kanchenjunga National Park. I got down from the hotel, all excited and enthusiastic, sharp at 7AM and this time no one was waiting for me. In fact, I was told to wait near a Xylo car numbered (SK****8) at a little distance. Well, it's not as it sounds, there was a reason behind this. Because of the last moment plan the permit could not be arranged and was needed to be arranged by the same morning itself, which was taking time as it was crowed cause definitely everyone who was waiting for the opportunity wanted to avail it on the same day. Finally, at around 8 AM, I saw Mr lama walking towards me along with a new face I assumed him to be the driver and it appeared that I was right when Mr lama introduced me to Suren. I didn't know by then that soon we were going to create a bond by sharing a strong connection and he was going to be my brother not by blood but by the bond. What happens next will be found out in the next part of this post. To describe Sikkim, just one part is not sufficient, it will be required at least 3 parts or maybe 4, we'll find out soon.